As is usual in this age the problems are complex. France’s economy has been ailing for a while (although I’ve read at least one analysis that they may be poised for an upswing). Hardest hit are as usual those outside the few big cities. The divide between rich city dwellers and poor country dwellers has been growing for years now. What makes this worse is that France as a country and as a political system is centered very much on Paris: the city and the province. Most career politicians have been to one of a few elite universities and they are a political class unto themselves, swampier even – from what I understand – than DC. There have been numerous corruption scandals lately. I won’t even get started on French immigrant politics and the “banlieus” as that is a quagmire I guess nobody really understands (if they did they might do something about it). To make it ever more complicated France has suffered several major terrorist attacks in recent years: Charlie Hebdo, Nov 13, Nizza and those are just the major ones (there’s always more). Much like the US there are two big parties – Parti Socialiste (PS, center-left) and Les Republicains(LR, center-right) – and a bunch of smaller ones that used to not amount to much. The current Presidente Hollande (PS) has apparently been doing a terrible job. He wasn’t even running for another term. One would expect then, that the conservative candidate from the LR is the next best bet: but Fillon has been in a big scandal about corruption and nepotism since January 2017 and I am personally surprised that he did not drop out of the running. This election marks the first that the LR candidate has not made the second round of the elections in modern France! For years now an extreme right-wing populist party called the “Front National” (FN) has been on the rise. Even more so since Marine Le Pen the daughter of the founder kicked out her even more extremist father and led the party into a somewhat more moderate stance – that is still extreme right. 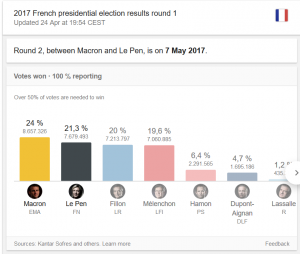 The major difference between the FN and the tea party is that in France’s political system the FN is not part of Les Republicains but a separate party – which is a good thing because LR voters will not automatically vote for Le Pen in round two out of partisanship, and Fillon can back someone else now that he is out of the race. Btw Marine le Pen has her own scandal. So with Le Pen seemingly set to take one of the two top-spots, Hamon/the PS quite obviously not really in the running, there were three candidates for the remaining spot in round two. So looking in from the outside, not able to do much but go march with #pulseofeuropeand tweet #restezavecnous(stay with us) there was about one third of a chance for a result that would postpone or even prevent loud calls for Frexit. That is the reason we were waiting with much dread for the first numbers at 8 pm last Sunday. With Le Pen and Melenchon 40% of the voters voted for EU sceptics, a sad result for the EU and another pointer that we desperately need reforms for the EU. Fillon, Hamon and most others have promised to back Macron for the second round to prevent Le Pen but she might still win. So now we’re hoping that once again 80% or more of the French will indeed vote and not follow yesterdays trending tag in France #SansMoiLe7Mai (without me on may 7) and that they will vote for the pro-EU candidate. The left is calling for boycott because “they will not elect the lesser of two evils” which is in my opinion an shortsighted and egotistical stance because one of them will get elected anyway. Boycott gets the Trumps of this world elected and walls built. Globalism is not always a good thing but it can’t be turned back. Politicians who promise easy solutions, promise to extricate their country out of the international entanglements and call “My country first” are bad for everyone. Previous PostPrevious Privacy – Why I care!